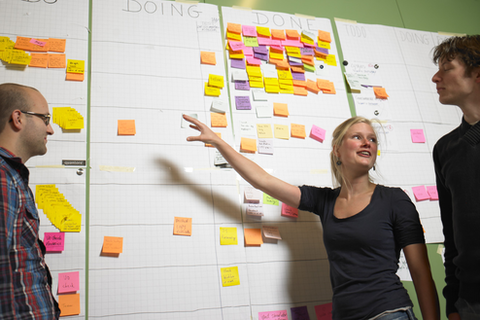 Applying Scrum changes the day-to-day reality of agencies dramatically. If done well, it improves output and profitability like crazy. However, for agencies, Scrum dynamics are radically different from in-house design and development teams. Our leading Dutch design agency, Fabrique, has built up over 35,000 hours of Scrum experience since 2008, designing and developing interactive products such as websites and mobile apps for national and international customers. It’s time to share our best-kept secrets. We prefer sharing them with experienced Scrummers, so we can skip intro and dive right in! This talk will feature tons of photos from our scrum rooms. Pieter Jongerius is a partner at the Dutch design agency Fabrique. Originally an Industrial Design Engineer, he specialized in web design as early as 1996, with a special interest in interaction, strategy and methodology. Fabrique specializes in strategic design for cross channel B2C communications and employs around 100 people. In recent years Pieter has specialized in retail & e-commerce and has done award winning work for national and international companies such as Heineken, Sony Music, SuperTrash, Hunkemöller, The Sting and more. Pieter is main author of the book "Get Agile! Scrum for UX and Development" and has been a pioneer of using Scrum in design and development projects since 2008.